This page contains common problems and solutions. If you have any issues with the server, please check here first. If you don't find a resolution here, there is a forum full of answers and a discord channel of other users. If you have a problem to report, do so here and track your trouble ticket progress here. The most probable cause for a library item to not play properly is that it is still processing on my end. As soon as I begin processing something new, it will immediately show up in the library. If it's not finished processing yet, it won't play or will play incorrectly. If you are using a browser to watch the files, try connecting through the Emby Theater instead. There are any number of reasons for buffering issues. If you are on a mobile network, or on a wiFi connection, your issues are likely to be internet or connection related. Try alternate methods of watching. If you are using the app and having problems, try using watching on the website and see if the issue is the same. Try a SpeedTest. Go to that link and click Start Test and wait for it to complete. If your download speed is anything less than 5Mbps then you will probably have buffering problems, especially for larger/higher quality files. If you are having a problem with a movie, try playing a few different movies to see if it is more than one thing giving you problems. If you are having the same problem in different places with different files and your speed is over 5Mbps, please let me know. 1) Try a different device. If the website is buffering, try using the app and vice versa. Step 1 is to elimate your device as the problem. If the website lags but the app doesn't, then the problem is with whatever you are using to watch on the website. Unless my server behaves the same way everywhere, it's not my server that is the issue so this is step one. 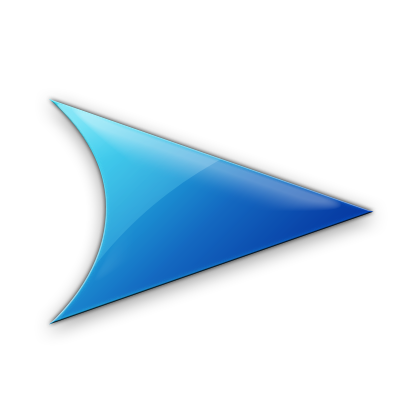 Kodi seems to perform the best. There are several different ways to watch my files. If one is giving you problems, try one of the other ways to narrow down where your problem is. 2) Run a speed test as mentioned above. If your speed is below 5mbps, then that is the reason. Remember that some of these files are very large. The higher resolution movies can be up to 50gigs in some instances. If your connection speed is slow, you will have buffering problems on these files. 3) Contact me or ask around in the discord server to see if anyone else is having problems. If you are having the same problem on multiple devices AND your speed test result is larger than 5Mbps, and no one else is hvaing problems, then contact me with the details of what you are trying to watch, what method you are using to watch (website or app) and what the problem is specifically. Contacting me with something like "i'm buffering how can i fix it" does not help me help you. I NEED to know specifically what you are trying to watch, how you are trying to watch it, and how you are connected (wifi, cell network, ect). Without this information I cannot help. This is usually because I have made a backend change to the server. Simple solution, reconnect. 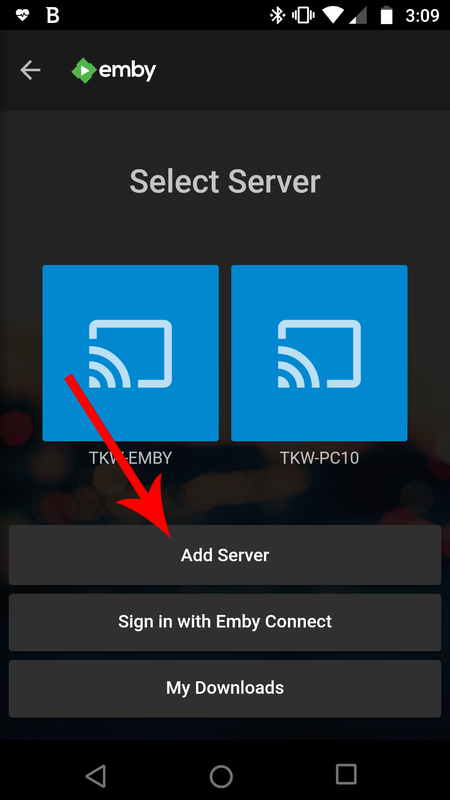 From the main screen of the Emby App, click Add Server no matter how many servers you might see to choose from. Click Add Server button. 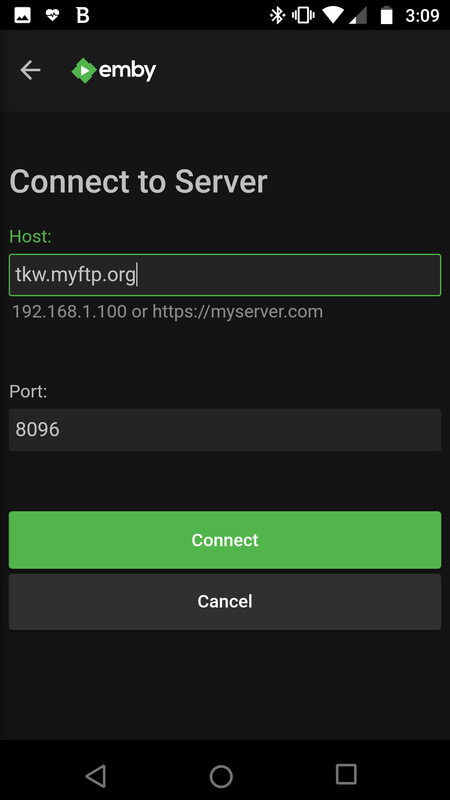 Set Host to tkw.myftp.org and leave port alone, then click Connect. After that, sign in like normal and you should be good to go. These are things I know don't work right, and are currently being worked on. The Videos will play fine, but the tagging is all weird. The names aren't all right, and some of them are missing. The music videos area is very much under construction. Feel free to explore, just know that the video that plays isn't always going to be what the server says it is.